UNION (KY) RULES THE WORLD – The tradition of NAIA teams upsetting upper division teams from the NCAA continues! Yesterday the NAIA’s UNION (KY) BULLDOGS were on the road against Division TWO’s UVA-WISE HIGHLAND CAVALIERS. The game was a hard-fought back-and-forth affair with the Bulldogs upsetting the Highland Cavs by a final score of 24-17. For newbies to these divisions it’s like when a 1AA (FCS) team upsets a 1A (FBS) team. NEAR MISSES – Two other teams came dangerously close to pulling off similar upsets in yesterday’s action. The NAIA’s EDWARD WATERS COLLEGE TIGERS came within a few points of upsetting NCAA Division TWO’s MOREHOUSE MAROON TIGERS. EWC wound up losing by a very tight score of 28-26. ### And Division Two’s EASTERN NEW MEXICO UNIVERSITY GREYHOUNDS nearly brought down Division ONE’s Incarnate Word Cardinals but fell 33-26. NUMBER TWO TAKES A FALL – The 7th ranked GRAND VIEW UNIVERSITY VIKINGS welcomed the number 2 team in the nation, the UNIVERSITY OF SAINT FRANCIS (IN) COUGARS. Any casual viewer would have thought the rankings were reversed judging by the way the Vikings outperformed the Cougars on both sides of the ball. The final score in this upset was Grand View 23 St Francis 7. Before MST3K there was The Texas 27 Film Vault! Balladeer’s Blog continues its examination of this neglected cult show from the 1980’s with another review of an episode where an original air date can be determined. My interview with Randy Clower, my research through VERY old newspapers and emailed memories from my fellow Vaulties are helping in this attempt to reconstruct elements of the show’s history. EPISODE ORIGINALLY BROADCAST: Saturday March 2nd, 1985 from 10:30pm to 1:00 am. FILM VAULT LORE: This is the 2nd oldest episode I’ve reviewed. The oldest episode was the February 9th, 1985 airing of Trunk to Cairo with Audie Murphy. Special thanks to my fellow T27FV fan Jessica for the serial episode and a comedy sketch from the episode. One of the comedy sketches in the show was a mock commercial for Blue Arrow Bus Lines, the fictional bus line in the movie. The phony ad hyped the bus line as the Official Bus Line of female fugitives on the run. 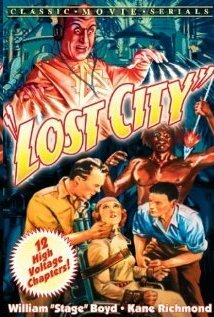 SERIAL: Before showing and mocking the movie machine-gun toting Randy Clower and Richard Malmos of the fictional Film Vault Corps (“The few, the proud, the sarcastic”) showed and mocked a chapter of the notoriously campy sci-fi serial The Lost City (1935). That serial featured a super-scientific city lost in the middle of the African jungle plus zombified “giant” African tribesmen, ray-guns, a slinky femme fatale and a tribe of pygmies. There’s also a Great White Hunter as the hero and a mad scientist whose inventions include a machine that turns black people into white people! And the “colorization” is considered a REWARD for tribesmen who serve the mad scientist well! All this plus BOTH William Boyds in one serial! 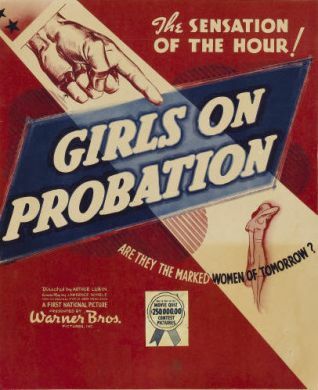 THE MOVIE: GIRLS ON PROBATION (1938) was one of the countless Warner Brothers B-movies that future president Ronald Reagan starred in before his career in politics. Reagan had just been inaugurated for his second term less than two months earlier so the Reagan jokes from our Film Vault Technicans First Class no doubt flew hard and fast. The Texas 27 Film Vault also showed Bedtime for Bonzo, another infamous Reagan pic, but I have yet to narrow down the exact date of that episode. MASSACRE IN RED, WHITE AND BLUE! – The undefeated 4th ranked team in the nation, the NAIA’s UNIVERSITY OF THE CUMBERLANDS PATRIOTS, were on the road against the 3-1 UNIVERSITY OF PIKEVILLE BEARS last night. The Patriots dominated this game on both sides of the ball in what was one of the most embarrassing losses ever endured by Pikeville. When all the dust had settled the Patriots won by a final score of FIFTY-NINE to THREE! A TALE OF TWO DIFFERENT TIGER TEAMS – The number 14 team in the nation, the UNIVERSITY OF WEST ALABAMA TIGERS devoured and digested the visiting CONCORDIA (AL) HORNETS. The final score in this one-sided affair was 71-14. ### On the other hand, the NORTHEAST MISSISSIPPI COLLEGE TIGERS were fighting in a losing cause last night. These Tigers wound up losing to the visiting MISSISSIPPI GULF COAST COLLEGE BULLDOGS by a score of 28-14. The government would NEVER steer us wrong, right? Welcome back to Balladeer’s Blog, the only site on the web that offers truly non-partisan criticism of those fanatics called Liberals and Conservatives. 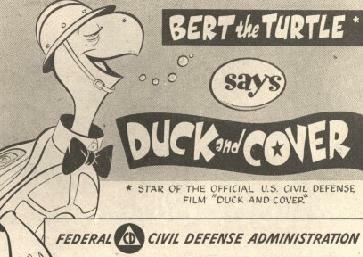 Remember the 1951 short Duck and Cover? It was U.S. government propoganda trying to allay fears about the truly catastrophic consequences of a nuclear war. The title came from the inane pretense that if “the bomb” went off the populace could survive it by ducking under desks or other furniture. Uh. Yeah. Makes that “nuking the fridge” scene in the last Indiana Jones movie look credible by comparison. It’s your old buddy Balladeer, but you can just call me “the puppet of Jews” like the Muslim fanatics who threaten me do. That blood-soaked beast among the world’s religions, Islam, is in the news once again for the usual reason: the ongoing war between Muslim fanatics and the modern world.